​since the early 1970s, but its roots go all the way back to the 1870s. We welcome you to come and visit us! ​Rick Hahn began his ministry at OCC in January 2016. Rick and wife Sue came to us from 44 years of ministries in Hawaii, Oregon, and California. 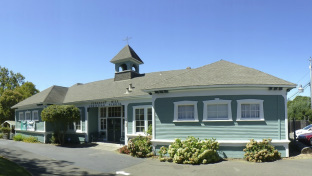 Locally, Rick was pastor at Sebastopol Christian Church from 1978-2008. Their ministries have all been with independent Christian Churches, much like OCC today. Rick was born in Honolulu, Hawaii, and was raised in a military family. They were stationed at numerous Air Force bases in a number of states as well as overseas in Japan. He accepted Christ as his Savior as a 9-year-old boy and received God's call to full-time Christian service at the age of 16. Sue was born in Scottsbluff, Nebraska, but spent most of her growing-up years in Oregon. She became a Christian at the age of 12, and like Rick was called into full-time Christian service at the age of 16. Rick and Sue met at San Jose Bible College in the 1960's and were married in 1965 at the beginning of Rick's senior year. They recently celebrated their 50th wedding anniversary, renewing their vows on the sands of Sunset Beach, Hawaii, where they began their first full-time ministry. God has blessed them with two daughters, Jennifer and Jodi, who are both married and who have in turn blessed them with 7 grandchildren. They all live nearby. of 2nd and Church Streets.